Sunny Nwazue was introduced to fantasy readers in Akata Witch, in which the Nigerian-American 12-year-old with albinism discovered that the differences between her New York City birthplace and the home she shares with her Igbo parents in Nigeria are separated by more than just cultural differences. Sunny is a member of the magic-wielding Leopard People; in addition to attending traditional school and playing soccer, she attends a magical school with other Leopard People students, and lives a life beyond her family’s scope. When Sunny experiences troubling dreams, she is informed that they are portents of a significant ecological disaster – one she and her allies can take action against, if Sunny can get herself out of the difficulties she’s created with her teacher by breaking the rules of her magic. Nnedi’s integration of multiple cultures and magical systems, including both Nigerian magic and creations of her own invention, will delight readers of all ages. 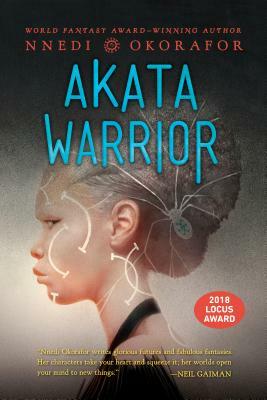 The newest novel by the author of Akata Witch and the forthcoming Marvel comic book series about Shuri, Black Panther's sister! Nnedi Okorafor was born in the United States to two Igbo (Nigerian) immigrant parents. She holds a PhD in English and is a professor of creative writing at Chicago State University. She has been the winner of many awards for her short stories and young adult books, and won a World Fantasy Award for Who Fears Death. Nnedi's books are inspired by her Nigerian heritage and her many trips to Africa. She lives in Chicago with her daughter Anyaugo and family. She can be contacted via her website, www.nnedi.com.